Gerry DiNardo's second Tiger team pulled out victories in two home games with exciting Q4 rallies. Here's the story of the first one. 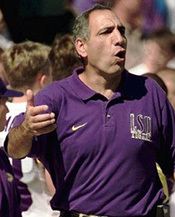 Gerry DiNardo "brought the Magic" back to Tiger Stadium when he was hired before the 1995 season to replace Curly Hallman. His first team compiled LSU's first winning record since 1988: 7-4-1. 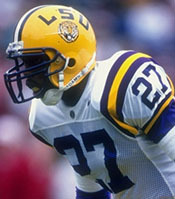 The '95 Tigers played in the school's first bowl game since 1988, the Independence Bowl in Shreveport, in which they defeat Nick Saban's Michigan State Spartans 45-26. TE Greg LaFleur, who had endured three losing seasons (one as a redshirt) under Hallman, recalled the change this way: Coach DiNardo came in that spring and changed the whole culture of the place. A very tough guy, a smart man who demanded respect. He really pushed us to our limit and tried to break us down. There was a lot of moaning and complaining, but looking back it was the right thing to do. ... He came in and instilled a mentality in us that we were going to be tough and run the ball. The offensive star of Gerry's maiden voyage was RB Kevin Faulk, the highest-ranked player in the state coming out of Carencro High School. DiNardo made Kevin his #1 target when he took the job in Baton Rouge. Faulk recalled: Coach DiNardo was hired and introduced, and then he walked off the podium and came straight to my house. It was 45 minutes after his press conference. He came to the high school, we jumped in the car, and drove home to meet my parents. 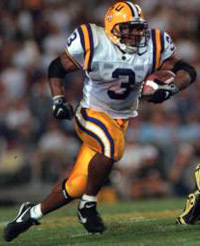 Faulk lived up to his billing by leading LSU with 852y on 174 carries and six TDs as a freshman. That was good enough to earn him SEC Offensive Player of the Year despite the fact that he caught only five passes for 86y, ran back two kickoffs for 36y and didn't return a single pu nt. Kevin also won the offensive MVP Award at the Independence Bowl. But an incident in his hometown February 19, 1996, nearly derailed Faulk's promising career. He was arrested outside a bar for failure to move on, resisting arrest, and two counts of battery on a police officer, who missed four months of work with a broken foot. Faulk recalled: The thing about it was, I wasn't even part of the fight. I was trying to stop it and was caught up in the confusion. On February 27, DiNardo suspended Kevin for the first game of the 1996 season. But the Wednesday before the Houston game, the Carencro Police Chief asked the parish DA to drop the four misdemeanor counts against Kevin. The defendant would still have to ride with police officers and speak at Carencro schools on weekends and holidays. The following day, DiNardo reinstated his star RB for the opener. Gerry explained that the suspension had not been for the misdemeanors but because "he showed a lack of respect for authority." Since Kevin "went back to the police and apologized," the coach insisted he was just doing "the right thing and the fair thing" by lifting the suspension. That explanation only exacerbated the charges of favoritism for his star RB. The '95 turnaround had Tiger fans at a fever pitch not seen since '87. A record number of season tickets - over 50,000 - were sold. The Tigers were ranked #17 in the AP poll and one preseason national magazine pegged them at #12. Several other publications predicted LSU would win the SEC West. DiNardo: This is it. We have to answer those expectations. It's time now. All the garbage is over. Let's play the game. Houston had a game under its belt, a 43-25 victory over Sam Houston State. Shackled by several years of NCAA sanctions, the Cougars suffered through a 2-9 season in '95, their fifth straight losing campaign. Houston had gone a miserable 4-28-1 the last three of those seasons under Kim Helton, who amazingly kept his job. (Some of the losses in his first year came via retroactive forfeits because of NCAA violations.) 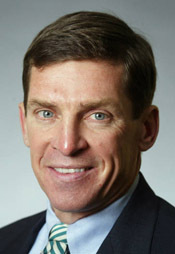 The penalties still were having an effect since Helton had only 69 scholarship playes, 16 below the Division I-A maximum. 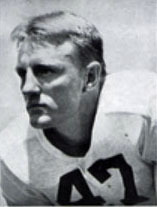 Senior QB Chuck Clements led the pro-style attack. He had thrown for 2,641y in '95. He's as good a thrower as I remember us playing against. said DiNardo. You watch him on tape, and you wonder if you'll see anyone throw better. With an inexperience secondary, the Tigers would rely on their good front and fine LBs to put pressure on Clement. However, LSU would be without its best D-lineman, though. T Anthony McFarland was sidelined with a broken foot. LSU entered the fray a 23-point favorite. Another Advocate reporter, young Scott Rabalais, predicted a Tiger romp, 38-13. He expected LSU to control the ball with its running game, but the Tigers would have to avoid giving up too many big plays. The mobility of sophomore QB Herb Tyler, who finished '95 with a 4-0 record as a starter, including wins the last three games, posed a threat for the UH defense. 80,303, the largest season-opening crowd in Tiger Stadium history and the fourth biggest overall, saw LSU need not just an average performance by Kevin Faulk but a sensational one to pull out their first season-opening victory since 1990. Amazingly, it was the first time LSU had scored in Q1 of a season opener since 1990 against Georgia. After punting to LSU, the Cougars got the ball right back when CB Delmonico Montgomery picked off a Tyler pass and returned it 30y to the LSU 40 with 0:29 left in the period. Faulk recalled years later: Everything we did early seemed to backfire. We were playing against ourselves as much as Houston. 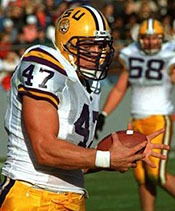 On LSU's first play, Tyler faked to Faulk and fired to Larry Foster who ran down the sideline to the Tiger 47. Faulk then took an option pitch around the right side for a 1st down at the UH 43. Two plays later, Herb kept the ball on the option to the 18. Faulk then tried to reverse his field on a pitch but lost 12y. That forced LSU to pass but two incompletions brought in Richey, who missed badly from 45y out. After forcing a punt, the Tigers had a chance to take the lead before halftime. Instead, Faulk fumbled the ball to UH at the 29 with 1:24 on the clock. Some boos rang down on the Tigers as they left the field at halftime. Faulk: When I realized I was in the open I started thinking, "Don't let anyone catch you now." When I hit the end zone I was relieved. In 2009, Faulk recalled his success at LSU: I had a good career there and a big reason was we had good offensive lines, guys good enough to play in the NFL. My favorite play was the zone play, where I would read off the linemen's leverage and make one cut and then go. Helton on not going for two: We missed a two-point conversion earlier, and we missed one last week. So we went for one. At that point, I didn't think they'd get back in the game. Faulk: The fumble really got me down. But I picked my head up and followed my blocking. ... When we got down by 20, we still thought we could win. Never for a minute did we think we weren't capable of coming back. 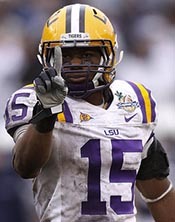 The Bengals gained their 15th and 16th first downs before two successive losses forced LSU to go to the air. That resulted in an INT when the ball was tipped into Parker's hands. Letting the play clock run down as far as possible before snapping the ball, the Cougars just missed a 3rd down conversion as the period ended. Faulk: He kicked it straight on, and I got a running start, so those are the kind of punts to return. It helped us shift the momentum of the game. 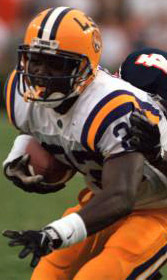 Kevin became the first Tiger to score more than one TD of 75+y in a single game. 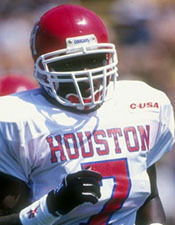 Houston RB Antowain Smith (later an NFL teammate of Faulk) remembered: We had a big discussion on the sidelines about whether to kick to Kevin or not. I guess they decided to take a chance. But the punt went right to him. Coach really chewed our punter out when he got back to the sidelines. Clements & Company rolled up one first down on a nice run by Smith before punting to the LSU 20. Faulk went to work right away, gaining 16 around LE on the first play and ripping off another 17 on the next through a big hole at RT. After a short run, Kevin gave way to redshirt freshman Rondell Mealey, who kept the momentum going with a 29y run to the 2. 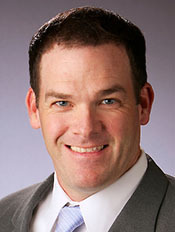 Mealey had been questionable for the contest with an offseason concussion and headaches. He had expected to be the starter until Faulk was reinstated. Afterward he said, Everybody's making a big deal about starting. It didn't matter if Kevin started or Kendall started. As long as we whipped Houston, it was no problem. ... I had no problem coming off the bench. I came to play. It didn't matter. Needing a FG to perhaps ice the game, the Cougars couldn't get close enough against the fired up Tiger defense and had to punt again. Kevin started the possession with scampers of 7 and 11y but then a blitzer dropped him for a loss as he took the handoff. That led to a punt. Mealey on his TD run: They didn't have anyone there, and I just ran. It was a great call. Though overshadowed by Faulk, Mealey ended the evening with 161y on just 14 carries. He became the first LSU freshman to rush for 100y in his first game since Dalton Hilliard gained 133 against Oregon State in 1982. 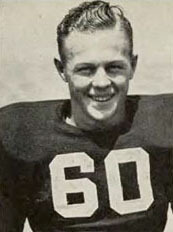 It was also the first tiime LSU had a pair of 100y rushers in a game since Harvey Williams and Sammy Martin against Georgia in 1986. With Kevin, I, and Kendall in the game, it's hard to stop us, said Rondell. In my first game, to have a night like this, I mean I can't have a better game. 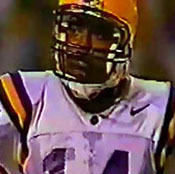 Fittingly, Faulk clinched the victory on LSU's next possession with a 43y scamper to the 17 on 3rd-and-1 with 2:05 left. He broke through a hole at RT and set sail for the EZ. But a diving Cougar got a hand on his heel and tripped him enough that he couldn't keep his balance and fell to the ground 15y down the field. The game ended with LSU taking a knee inside the 10. Houston ended the second half with just 112y and five first downs. The Tigers outgained the Cougars 201-49 in Q4 and outscored the visitors 21-0. Kevin Faulk breaks into the open on his game-clinching run. Faulk's 246y rushing (on 21 carries) and 376 all-purpose yards were both school records. 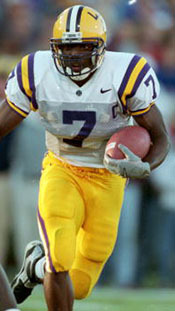 His performance ranked 2nd in SEC history for all-purpose yards behind Kentucky's Moe Williams (1995). The statistics implied LSU dominance rather than a one-point squeaker. But Tiger turnovers and penalties allowed Houston to build the 20 point lead. DiNardo: That's one of those early retirement games. ... To me, the most important thing he did was come back from the (second) fumble. ... If a group deserves tremendous credit, it's the offensive line. ... We put ourselves in a hole with the turnovers. I think Houston played a heck of a game with a good plan. We could have played better on offense as far as the turnovers are concerned. On Faulk: I was impressed with the way he came back after he fumbled. That would demoralize most people. ... I was praying I would have a good game because I knew you'd be hassling me if I didn't. ... I owe everything tonight to blocking. The offensive line was unbelievable. They opened up the holes, and luckily we were able to bring it home.Faulk: If you want to call it a great game, okay, but I fumbled two times. A legendary Tiger RB congratulated Kevin in the locker room. Charles Alexander, whose record of 237y against Oregon in 1977 Kevin broke, told onlookers, That was one of the best performances I've ever seen in this stadium. They'd better get ready to put him in the Heisman race. LB Allen Stansberry spoke for the defense: Heart, pride and the want to win. That's how we came back tonight. I tip my hat to the offensive line. We came back in the second half and stepped up and did the things that we were capable of. Houston coach Helton was steaming. I think the greatest thing that happened to them was the fact that their coach changed his mind and let No. 3 play. No. 3 got unsuspended and made a lot of runs. He's a talented guy. ... Fatigue got to us. It was a great job by them. They pushed the ball at us ... We really didn't feel we allowed them to get back in the game. To their credit, they got themselves back in the game. 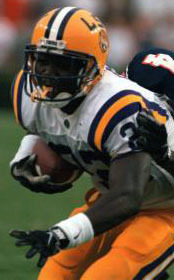 LSU concluded its 1996 home schedule with the annual "Battle for the Rag" game against Tulane. The Tigers entered the fray with a 7-2 record, the losses coming at Florida (56-13) and at home to Alabama (26-0). LSU was under consideration for four bowl games: Citrus, Outback, Peach, and Independence. Buddy Teevens' fifth Tulane squad was ending a dismal season with a 2-8 mark. Tulane players elected to remove the T logo from the right side of their helmets for the game in a show of support for their coach, who had been fired two days earlier, effective following the game, after winning just 11 games in five seasons. 78,966, the largest crowd ever to see Tulane play in Tiger Stadium, completed a new LSU home attendance record for a single season. For the second week in a row, the Tigers started slowly. The fired-up Green Wave completely stymied the offense during the first half, holding LSU to just 69 total yards. They did a particularly good job of bottling up All-SEC RB Kevin Faulk, who gained only 26y in the first 30 minutes of play. The only Tiger score came with 4:33 left in Q1 on an 85y INT return by S Mark Roman on a Shaun King pass that was tipped by DE Theo Williams. On the previous play, Roman had leveled Tulane WR Jeff Liggon to prevent him from catching a pass at the 4. Williams: I saw the tackle block down, and I knew it was going to be a three-stop drop. I just got my hands up, then I ran down to block. Roman complimented Williams for his tip and also DBs Greg Hill and Cedric Donaldson for their blocks on the return. I think it was a total team effort. The Green Wave responded with an eight-play, 80y drive that finished with a 46y TD pass from King to P.J. Franklin to tie the score with 1:25 left in Q1. Neither team scored in Q2 to leave the score 7-7 at the break. The Green Wave had a chance to score on the final play but, rather than attempt the 40-yarder, tried a fake FG that had RB Alan Moorhead running free until he was knocked out of bounds at the 15. The Tigers were lucky to head to the dressing room with a tie. Tulane outrushed LSU 149-36 and gained 115 more through the air to LSU's 33. Tulane led in first downs 14-3 and in plays 46-15. LSU fell behind twice in the second half. Faulk finally got untracked on LSU's next possession. He ripped off a 31y gain on the first play as the Tigers drove to the 1, from where Tyler ran into the EZ to regain the lead. LSU 14 Tulane 10 (8:02). LSU responded with a run-dominated drive of their own to regain the advantage. Starting from the 20, Tyler connected with WR Larry Foster for 11. Two Faulk runs gained 15 before Tyler gained another 3. 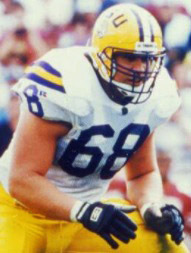 Then Herb threw to massive TE David LaFleur (6'7" 275lb) for 7y and a 1st down at the Tulane 45. Rondell Mealey, the backup to Faulk who would start for 90% of the colleges in the nation, gained 6 before a holding penalty set back the Tigers. Kevin returned and was thrown for a 2y loss after taking a swing pass from Tyler. Facing 3rd-and-15 from midfield, Tyler and Faulk combined on one of the biggest plays of the evening. Operating from the shotgun, Tyler could find no one open downfield. So he floated the ball to Faulk in the right flat. Kevin grabbed the ball at his shoe tops and scooted 24y to the 26. Coach Gerry DiNardo: That was the turning point of the game because it kept the drive alive. It was as fine a catch as I've ever seen. He can ignite you, and he did. Faulk: It was just react and catch. The aroused Tiger D began the final period by forcing a three-and-out to give the ball back to the offense, which embarked on another scoring drive. 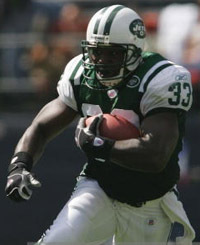 The Green Wave aided the Tigers with a personal foul penalty on Faulk's punt return to set up the Tigers at the Greenie 31. Kevin scampered 11y, then gained 3 and 9 to move the chains again to the 8. Mealey and Tyler each gained 3 before Herb rolled out and flipped to LaFleur in the EZ to give the Tigers their biggest lead of the evening, 28-17, with 11:01 left in the game. Several teary-eyed Tulane players lifted Teevens for a ride off the field. The hard-fought victory was LSU's 13th in a row over the Green Wave. LSU coach Gerry DiNardo was asked if he was disappointed that Auburn didn't upset Alabama, which would have given his Tigers a shot at the SEC West crown. I guess. I don't know. I was more worried about winning our game to be honest with you. ... We wanted to start playing a little better regardless of the circumstances, but we didn't do that. Tyler: We started out slow again. We just have to start faster next time. We made some stupid mental mistakes. Faulk agreed: We've got to work on that. OT Ben Bordelon was one of 13 seniors playing in their final game in Tiger Stadium. It was very emotional. I'll never run through those goal posts again. My time is up, but I've had a great time here. On the offense's improvement in the second half: I don't think we changed at all. It was just a matter of attitude in the second half. LB Allen Stansberry echoed that same theme. We didn't get a good start in the first half. If anybody was paying attention to that (the score of the Alabama-Auburn game), they were a fool. He praised Tulane. That team tonight was not a 2-8 team. DT Anthony "Bogger" McFarland on the defense's improved play in the second half: There comes a point when you've got to put your foot down. It's like the old cliche, "Enough is enough." Teevens: We had a lot of distractions during the course of the week, and they are a very resilient bunch, and I'm very proud of them. I'm very fortunate to have coached a bunch of kids like this, especially the senior. ... I think there are better days ahead of Tulane, and I'm sorry I won't be here to see them. Buddy praised the Tigers. We played a real good outfit. They're not ranked in the Top 25 for no reason. We played them flat out. I thought we played a good game. But in the second half, it was their time. They did some things themselves. But our kids kept playing, and they didn't seem to quit all season. 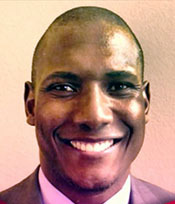 On Sowell: Jerald is a special player. He played hard tonight. He was here in his own backyard (Sowell attended Baker High School), and he wanted to do well for the people. Jerald is a gifted guy. You will seem him play again in the future. The Tigers defeated Arkansas in Little Rock 17-7 the following week to finish 9-2 and earn a share of the SEC West title although Alabama owned the tiebreaker. Invited to the Peach Bowl, LSU defeated Clemson 10-7. From 1917-1931, Tulane beat LSU ten times with one tie to only three victories by the Purple and Gold. But the tide turned starting in 1932. LSU won four of the next six against the Greenies with one tie. 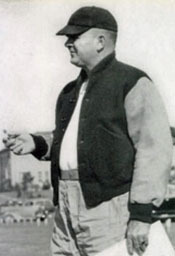 The powerhouses that Bernie Moore developed in 1935 and '36 walloped the Green Wave by a combined 74-0 score. 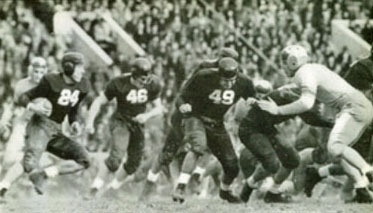 Before the 1937 game in New Orleans, the captains of the two teams made a pact that started a new tradition for the annual clash. RB Pinky Rohm was acting captain for LSU for the game. The annual finale had special meaning for him because he was from the Crescent City (Fortier High School). Before the toss of the coin, Pinky made a deal with Tulane's co-captains Norman Buckner and Norman Hall. We agreed the captain of the winning team could cut out the seat of the other captain's pants as a souvenir. When LSU won 20-7, Rohm went to the Tulane dressing room to claim not his pound of flesh but his square of cloth. While dodging cleats thrown at him by the Greenies, Pinky borrowed a pair of scissors from the Tulane trainer and removed the seat of Hall's football trousers. 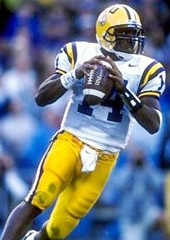 The LSU captain preserved the patch, which became a forerunner of what became known as "The Rag." 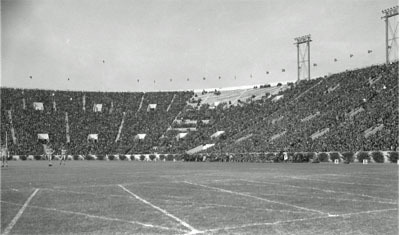 Tulane ended LSU's three-game winning streak by upending the Tigers 14-0 in Tiger Stadium in 1938. 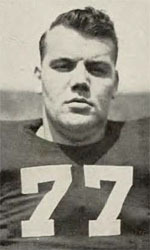 The star of the game was Green Wave RB Bob "Jitterbug" Kellogg, who wanted to play for LSU but was deemed "too small" by Bernie Moore and his staff. Another explanation is that Moore did not want married players on his team. Kellogg gained 131y in 21 carries - more yardage than all the LSU backs combined. 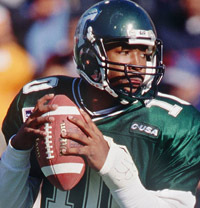 He scored one TD, kicked two PATs, threw Tulane's only completed pass that set up the Wave's first TD, played S superbly, and returned four kicks 51y. 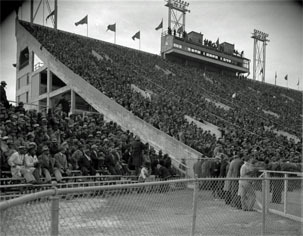 Opening of north end zone in Tiger Stadium for Tulane game of 1938. The picture at the left shows the African-American seating area in Tiger Stadium. But the enduring story of the game was the free-for-all that broke out at the end. Feelings were high and play rough from the beginning. At one point, linemen Tommy O'Boyle of Tulane and Jabbo Stell were ejected for fisticuffs. With 35 seconds left and the outcome no longer in doubt, the Green Wave ran a play up the middle. LSU's Bruce Hedrick slugged the Greenie back and was ejected. LSU was penalized 30y. 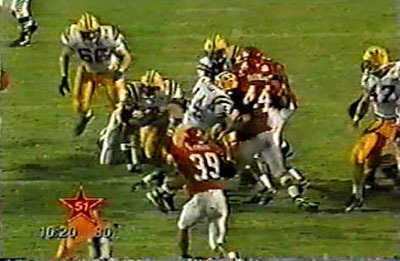 On the next play, Bernie Smith blocked LSU back Young Bussey. Smith said afterward: After I blocked Bussey, he took a pass at me, and he knocked my headgear mask into my mouth and broke a couple of front teeth. When I found myself with a mouthful of teeth, I got mad and took a poke at Bussey. The next thing I knew everybody was throwing punches. Players on both sidelines went onto the field. Soon a couple of dozen scraps were going on at the same time. Both coaching staffs as well as the officials, LSU cadet officers, and state police tried to halt the hostilities. After five minutes of milling, order was restored. The officials called the two elevens together to insist on calmness so the game could be completed. When the game ended, the Tulane and LSU players shook hands. But then another battle broke out, this one involving the fans. A mob of Tulanians jumped out of the stands and made a beeline for the north goal posts to tear them down. They were met by a score of LSU followers. 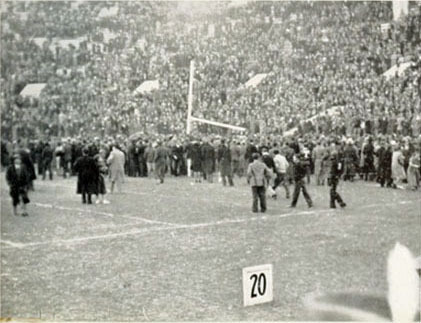 One reporter estimated that as many as 100 fights broke out around the goal posts, which were finally torn down by the determined Green Wave fans. Several renditions of "The Star Spangled Banner" by the Tiger band failed to halt the fisticuffs. The P.A. announcer begged, Please leave the stadium. Time and tide and trains wait for no man. An estimated 1000 of the crowd of 38,000 was involved in the melee as were mascots, cheerleaders, and water boys. The battle ebbed and flowed from one end of the field to the other. 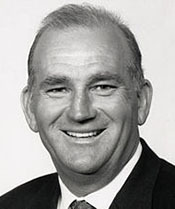 Bernie Moore watched the fracas from the tunnel at the north end of the stadium. There must have been 15,000 people on the field throwing punches. ... One thing I'll never forget. When the fighting was at its peak, a little blond cheerleader ran out of the m illing throng over to where I was standing. "Coach," she told me, "ain't we having fun?" Then she turned right around and ran back to join those crazy folks. Fighting continued until moonlight, with small skirmishes continuing with frozen sugarcane sticks in the fields south of the stadium. Bill Keefe of the Times-Picayune called it one of the roughest games ever played between the two teams - a game which wound up in the most disgraceful exhibition of hoodlumism that ever marred this annual contest which, for years, has been a clean and sportsmanlike affair. The football field is neutral and off limits to students. A rectangular flag of purple and blue cloth bearing the Louisiana seal would be awarded to the winner. The presentation would take place at a banquet of the two student councils after the game. 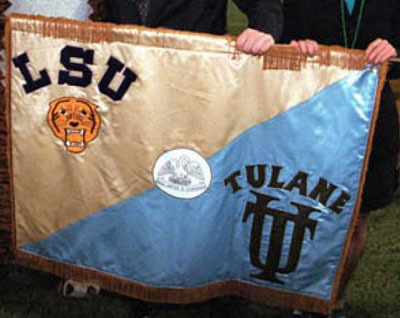 Originally, the new trophy was referred to as the "truce flag." But after a 1942 free-for-all (not as violent as the one in '38), the prize was called "The Rag," and that stuck.